Hello Erin. Thank you for joining me today on LisaTalksAbout to talk about your fabulous new book Somewhere Only We Know. As you know, I recently read this book and fell completely in love with it. You probably get asked this a lot but where did the inspiration come from to write Somewhere Only We Know? I didn’t have to look very far for inspiration as my best friend was also a Russian-born, London-based lady and spent several years in and out of hearings about her visa status and her rights to stay in the UK. Like Nadia in the book, my friend had lived here all her known life, and spending years knowing that at basically any time she could be deported – dragged away from her friends and her partner – was horrible. And eventually, she was. I knew I wanted to write a book where the main character was inspired by how amazing and strong my best friend was through it all, I just wasn’t sure what the story was until the character of Alex wandered into my head one day. His downtrodden, mopey Britishness was a perfect foil to the get-up-and-go of the Nadia character who had been brewing for months. And a love story was born, haha! Immigration is a particularly contentious issue at the moment. Was it a conscious decision to have it as the central theme in Somewhere Only We Know? Immigration is definitely a hot topic – one that’s grown even hotter since I first started drafting Somewhere Only We Know. You hear about “30,000 Romanians” about to migrate to London, and when you already can’t fit on the buses that take you to work in the morning, or you can’t get your child a place in a school within ten miles of your house, it’s definitely acceptable to be concerned. What I tried to get across with Nadia and with Somewhere Only We Know though was that we should never lose sight of the individual. London is as much a character as Alex and Nadia in Somewhere Only We Know. You describe the city beautifully. Where are your top recommended spots/favourite places to visit in the Big Smoke? I have a full-time job so my writing gets slotted in wherever and whenever it possibly can! I do spend a long time turning a story over in my head before I move to a notebook, jotting down a giant mess that would make no sense to anybody but me. So I’m usually quite confident in the story and its characters and progression before I actually begin writing and as a result my first drafts are super clean – neither of my novels have materially changed from first draft to publication – they just get tarted up a little! What piece of advice would you offer to the budding novelist? Try and write something – anything! – and read every single day – any athlete would exercise, and so should you. So, what is next for Erin Lawless? Can you give us any clues on your next project? 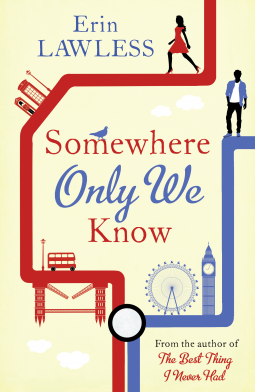 Somewhere Only We Know by Erin Lawless is available from 11th June 2015. Follow Erin Lawless (@rinylou) on Twitter.